DeKalb County is subject to natural hazards that threaten life and health and can cause extensive property damage in the past. Floods struck the County in 1973, 1974 and 1996, and severe winter storms in 1979. While these hazards are acts of nature, the impacts on residents, public facilities, businesses, and private property can be diminished through hazard mitigation. The Community Development Department undertook a Natural Hazards Mitigation Plan for the County. This Plan identifies activities that can be undertaken by both the government and the private sector to reduce the safety hazards, health hazards, and property damage caused by floods, tornadoes, earthquakes, severe summer storms, and snow and ice storms. The plan also examined man-made hazards that can impact the County. 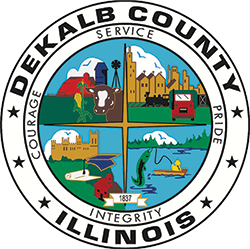 The continued work is being coordinated by the DeKalb County Hazard Mitigation Committee, which was created by the County Board on September 20, 2006. The Committee’s members include representatives of County offices, interested municipalities, and stakeholder organizations. “Hazard mitigation” means doing everything that can be done to reduce the impact of the natural hazards on people and property. It does not necessarily mean controlling floodwaters or stopping tornadoes. These hazards are natural phenomena and, in many cases, mitigation means adjusting what people do in the face of this natural activity. Structural flood control projects, which include levees, reservoirs, channel improvements. Property protection measures, such as relocation out of harm’s way, retrofitting buildings, insurance. Preventive measures, such as zoning ordinances, building codes, and other development regulations. Emergency services including warning, sandbagging, evacuation. Natural resource protection that can include wetlands protection, urban forestry programs. Public information efforts, such as outreach projects, and technical assistance to property owners. For more information, contact Shauna Urlacher, planning consultant, at 708-253-7993 or Derek Hiland at 815-895-7188.